"Let brotherly love continue. Do not forget to entertain new comers, for by so doing some have unwittingly entertained angels." 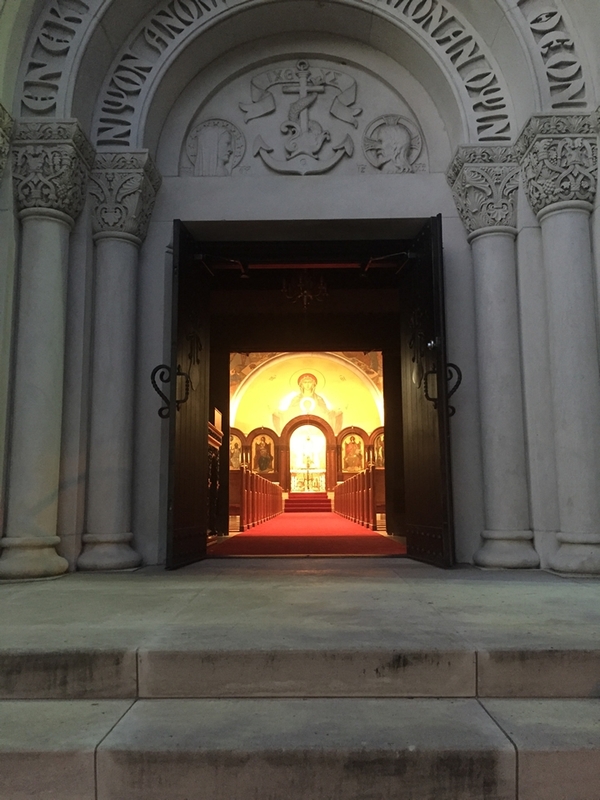 Hello and Welcome to Holy Trinity-Holy Cross Greek Orthodox Cathedral. The Greek word Φιλοξενία (Philoxenia) means Hospitality. For over 100 years, Holy Trinity-Holy Cross has been proudly serving and ministering to the needs of the Orthodox Faithful in Central Alabama. Quite simply, our goal is to witness and share the teachings, compassion and hospitality of Our Lord and Savior Jesus Christ and His Church with you. On behalf of our membership, we invite you to attend Divine Liturgy. Whether you are an Orthodox Christian arriving in the Birmingham area and looking for a new parish to call home, or are just interested in learning more about our Faith–and your own Christian roots–we invite you to explore this website and visit with us. ● Divine Liturgy begins at 10:00 a.m. every Sunday. ● Parking is available on the corner of 19th Street South and 3rd Avenue South, directly across from the main entrance of the Cathedral. ● Nursery is available on the second floor of the Education Building. ● Volunteers are present at the entrance of the Cathedral to welcome you and distribute our Sunday Bulletin. In the Sunday Bulletin you will find the Sunday hymns, Gospel and Epistle readings and parish announcements. ● Please sign our Guest Book so our clergy can introduce you to our parish. ● Upon entering the Cathedral you will have an opportunity to meet some of our Parish Council members and to light a candle. ● The Divine Liturgy lasts approximately an hour and half. Sometimes after the Divine Liturgy, memorial prayers are offered for the departed. This information is in the Sunday Bulletin. ● Our congregation, although having its roots in Hellenism, is composed of many diverse ethnicities. Most of the service is in English with several hymns and petitions offered in Greek. You do not have to be Greek to join our parish! ● The service can be followed in the Divine Liturgy Hymnal. Please feel free to ask anyone sitting near you for assistance. ● Remember the time when people put on their "Sunday best" to go to church? As a reminder, most Orthodox Christians put on their ‘Sunday best’ when attending Divine Liturgy. At a minimum, women wear dresses or skirts and men are business casual. ● Finally, at the conclusion of Divine Liturgy volunteers are available next to the Cathedral Book and Gift Shop located adjacent to the Cathedral on the first floor. There you will find a friendly face, a cup of coffee, baklava and answers to any questions you might have. ● If you have additional questions prior to your visit, please contact the Cathedral office at 716-3080.